Juki has lined up a new standard model "Simple Series" to the 1-needle, lockstitch machine with thread trimmer. The DDL-8000A is the new lockstitch from Juki and the flagship model in the Simple Smart Series of machines. This model is a perfect combination of advanced sewing performance and economical design. With a powerful internally build motor both space and costs are saved over traditional eternal motors. The DDL-8000A comes with a USB port for the charging of personal electronics right in the machine head. With the advanced dry technology of enabling operation without being lubricated, a frame which does not need lubrication has been developed. It is provided with not only a high-speed sewing capability but also a safety feature for preventing oil stains. When the amount of oil changes to empty or full, the machine informs using a voice guide. 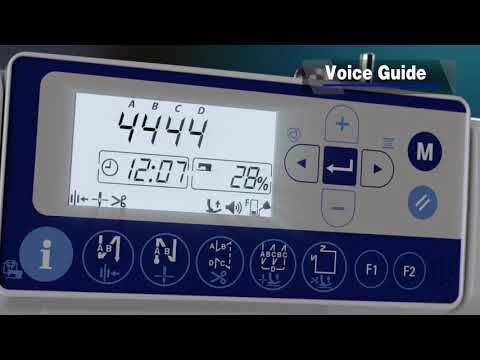 The other voice guidance includes sewing machine operating rate, productivity achievement rate, etc. AE Sewing Machines stock and supply all major spare parts for all industrial sewing machines. We supply spares parts, accessories, needles plus many more items. Having over 100,000 spare parts on the shelf at any one time and with our wide range of supply chain networks around the world, we'll be sure to find you the spare parts at the right price.